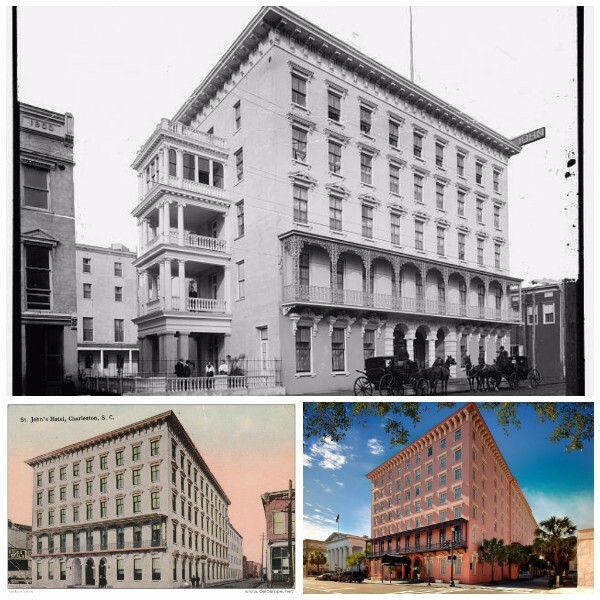 Last week we explored the hotels around Marion Square, but no discussion about Charleston's hotels would be complete without including the grand old hotels of Meeting Street, now gone but not forgotten. From the ashes of the Burnt District caused by the fire in June, 1835, the Pavilion Hotel and the Charleston Hotel were raised in the late 1830s, only to be burned by the Great Fire of 1838 and then rebuilt. They operated as hotels until they were demolished in 1957 and 1960, respectively. A few blocks south on Meeting Street was St. John's Hotel (Mills House) and the Timrod Hotel, which were both demolished in the 1960s. Many Charlestonians lament their destruction, especially the Charleston Hotel, which was considered an icon of the city. Originally the Pavilion Hotel (ca 1838), then the St. Charles (bottom left), then the Argyle (top). Now the King Charles Inn occupies the corner of Meeting and Hasell. On the northwest corner of Meeting and Hasell Streets, where the King Charles Inn stands now, the Pavilion Hotel was built in 1838 (rebuilt in 1839 after the fire), making it one of the earliest hotels in the city. The unusual entrance faced the intersection of the streets, an archway made of rusticated block. The second floor had graceful balconies with elaborate ironwork, which were later removed. An article on Charleston hotels in 1857 described it as for "those who prefer ease to ceremonial, and creature comforts to any velvet-cushioned chair of state." It underwent "remodeling and remodernizing" in the 1870s, now including "elevators, electric lighting, and annunciator." The four-story hotel could accommodate 100 people and had parlors, reception rooms, offices and a billiard room. Each room was said to contain a fireplace, and the hotel boasted two bathtubs on wheels, which could be brought into guest's rooms when they wanted to bathe; it is rumored that these were the city's first bathtubs. Rubadubdub! The Pavilion became the St. Charles in 1885 and was nearly destroyed by fire in the late 1890s. It was purchased, restored, and renamed The Argyle by a Scotsman named John Wilson, who hoped to draw major crowds during the South Carolina Interstate and West Indian Exposition. The Argyle was sold to Charles Rausch in 1934 and passed on to his daughter Mrs. Hollis Ayers, who had it razed in 1957. In 1964, she held the grand opening of the new 'Colonial style' 80-unit 'luxury motel' on the site, naming it the King Charles Inn. Like many other modern motels being build in the city at that time, there was plenty of parking, a pool, and several options for drinks and dining like the "Ghost Rider Lounge" and the "Beef Eater Lounge". 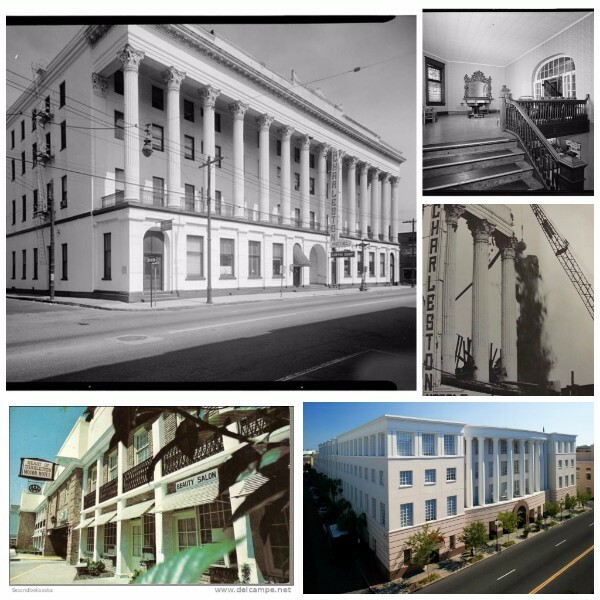 Y'all might remember its 'Colonial style' before the facelift in 1997 when the "main facade was recreated to resemble the cast-iron storefronts found on shops directly to the south, but more contemporary to reflect the building's age." After a 30 year association with Best Western, the hotel recently underwent a huge overhaul and is now independently owned and operated as a boutique hotel. 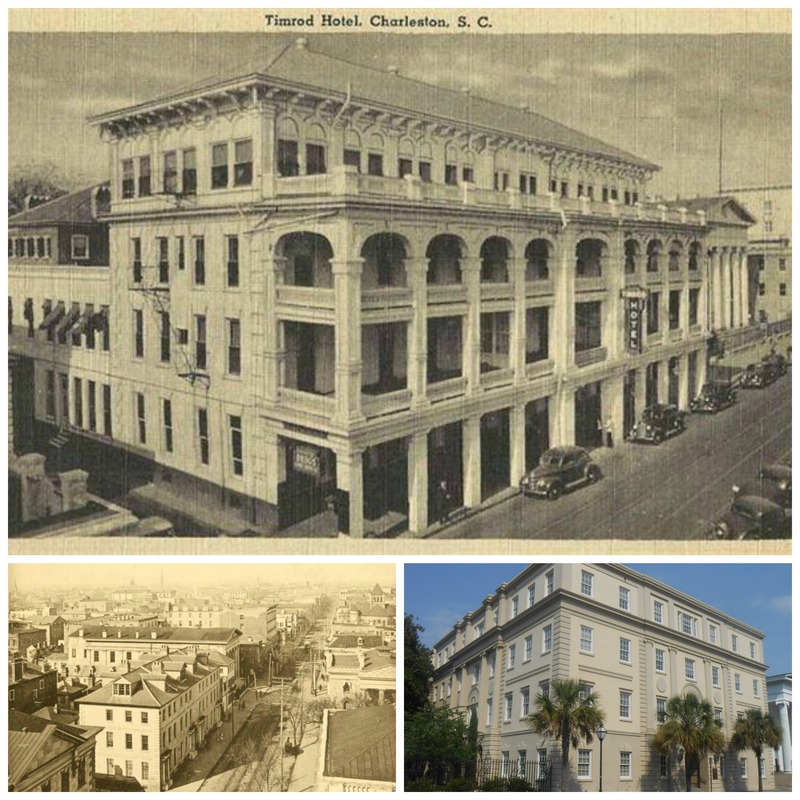 The Charleston Hotel (top 3 pics) was built in 1837-38, rebuilt in 1839, and lost to the wrecking ball in 1960. The Heart of Charleston Motor Hotel (left) took its place, which in turn was replaced by the Bank of America Building (right), whose design echoes the old hotel. By the middle of the 1830s, Charleston was beginning to look up from the economic deterioration that had hit this 'once flourishing city'. The South Carolina Canal and Railroad Company had completed the world's longest railroad under one management, King Street shops were bustling again and Charleston was beginning to find some of its old self-confidence. Charleston's merchant-boosters invited leading architect Charles F. Reichardt to design a hotel to match their vision of Charleston as "Queen of the South". Built in the Greek Revival style, the four-story Charleston Hotel featured an imposing colonnade of 14 two-story Corinthian columns with a second-floor piazza and wrought iron railings. This 'splendid and commodious palace' capable of accommodating 300 guests filled an entire city block and had a central courtyard and gardens behind the impressive facade. Just before the scheduled opening of the no-expense-spared hotel, the Great Fire of 1838 destroyed it and all of Ansonborough. The hotel was quickly rebuilt and opened the following July. To many Charlestonians, the loss of the Charleston Hotel is on the same par as the demolition of the Orphan House (which was behind the Francis Marion Hotel). Although preservation efforts were successful in saving much of the built city, the 1940s heralded campaigns to clear slums, raze tenements, and extend sewer lines in an effort to improve sanitary and health conditions throughout the city. The Orphan House building was condemned in the late 1940s by the Charleston County Health Department. During the 1950s, talk began of razing the Charleston Hotel and replacing it with a drive-in motel. 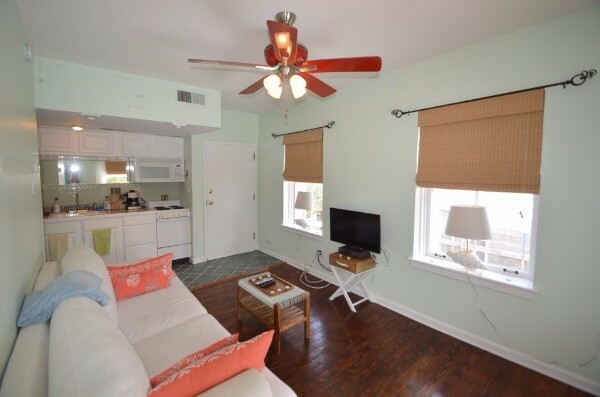 Although it had been remodeled several times in order to keep current with the changing demands of comfort, over time it was viewed by many as old-fashioned and outdated. It succumbed to the wrecking ball in 1960 and the Heart of Charleston Motor Hotel went up in its place. This prompted Charlestonians to push to expand the boundaries of the Historic District. Of course, by the time the motor lodge was outdated, the prime real estate was developed into a huge bank and office building with attached garage parking. The raised multi-story portico recalls the appearance of its stately predecessor. The original Mills House Hotel (1853) was renamed the St. John Hotel in 1901. The building was destroyed in 1969 and a near-replica built in its place became the new Mills House Hotel. The original Mills House Hotel was built by merchant Otis Mills in 1853 on the southwest corner of Queen and Meeting Streets. The five-story building had an iron balcony, terra cotta cornices across the windows, an arcaded entry and was noted at the time for its grand scale and modern equipment. There was a dining saloon, a gentlemen's dining room, a second-floor ladies "ordinary" with tables for 160, and 180 gas-lit guest rooms. There were eight "bathing rooms" for ladies on each floor, with similar rooms for the gents on the first floor. The brick house beside the hotel, next to Hibernian Hall, was used as a bar room and billiard saloon. The grand hotel remained relatively intact during the Great Fire of 1861 (with General Robert E. Lee as a guest) but sustained some damage during the Civil War. It was renamed the St. John's Hotel at the turn of the century after the new owner's son. 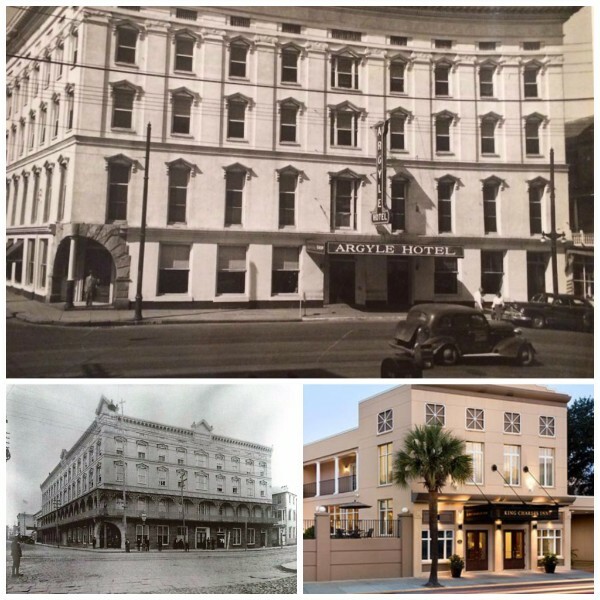 The St. John had a lot of competition as the years went by and new hotels such as the Ft. Sumter and Francis Marion Hotels opened (both in 1924) with more modern amenities. While tourism kept the hotel open, it did not generate enough revenue to keep up maintenance or fund upgrades. In dilapidated condition, the once grand hotel was sold at public auction in 1968. The local businessmen who bought it intended to restore the hotel, but it was too foregone. Instead, they razed the building and built a near-replica, using, for instance, the original terra cotta window pediments to cast for reproductions. The original iron balcony was installed on the new structure and by all accounts it does look nearly the same--except it did grow two extra stories! The Timrod Hotel (top), formerly the Commerce Club, was fashioned from four adjoining homes on Meeting Street (left). The O.T. Wallace County Office Building opened on this site in 1970. Have y'all ever seen old photos of the Courthouse and wondered what all those balconies were behind it on Meeting Street? Answer: The Commerce Club, which became the Timrod Hotel and then the Timrod Inn. In 1902, a group of businessmen bought a row of ca 1780 Georgian homes that consisted of two sets of adjoining homes on either side of a central arched passageway. 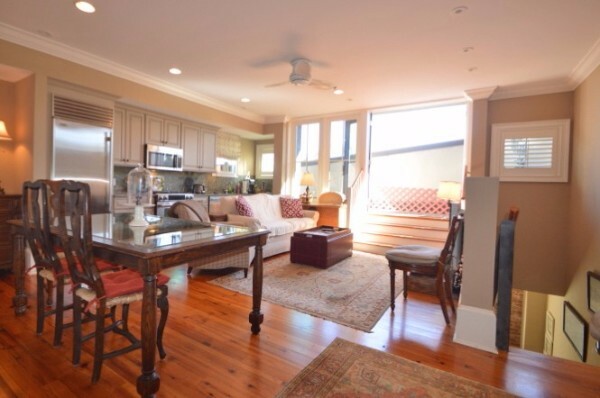 The structure was heavily remodeled into a gentleman's business club: the roof was taken off and a window-filled fourth floor was added, an addition was added to the rear, and a three-storied piazza with a fourth floor balcony was added over the sidewalk. A few years later the club was sold and remade into The Timrod Inn (there is a 1901 bust of poet Henry Timrod across the street in Washington Square), later called Hotel Timrod or Timrod Hotel. There were 66 rooms, two parlors, and four offices or stores. The Timrod changed hands many times over the years, sometimes bought with the intention of converting it to something else--lawyer's offices, for instance. That would have been quite convenient considering its proximity to Broad Street. A coffee shop that operated in the hotel was for years a favorite meeting place for politicians and lawyers since City Hall was across the street and the County Courthouse right next door. Can you imagine the deals that went down inside that place? Well, by the 1960s, the Timrod had become pretty run down. It was vacated in 1963 and demolished in 1964 with the idea that the space could be used as parking for jurors and courthouse visitors. When the County decided to build an office building here, the BAR advised that the "new building should be constructed in such as a manner to be architecturally compatible with the present courthouse." Well, okay, I guess we should consider ourselves lucky that the courthouse itself made it through the 60s without getting the wrecking ball (yes, it was discussed).